Kitae(forging pattern) : Kitae is fabulous fine Itame hada generally with the indication of Mokume burl. The entire steel gives off Nie-utsuri of sparkling martensite particles glitter that comes from fine steel quenching process. Hamon(tempering pattern) : Hamon state is a Nioi-deki in general to form flamboyant large Gunome where shows box-shape or horn-shape indications. Some Tobiyaki isolated temper or abundant Muneyaki forms Hitatsura in full area. In places of hamon gorges, it perceives a rather on stronger side Nie with sparkling martensite particles glitter and delicate lines of Sugagashi streams across feet of Ashi that emit to the cutting edge. The interior of temper is filled with misty sparkling Nioi where is shining brightly. Boshi (tip): Upper the Fukura area toward tip, stronger, thicker and brighter the Nie to perceive delicate Sunagashi area then refined small circle turns back to form Jizou-boshi like a side view of Jizou stone stature. Nakago(tang) : The tang is UBU original. One Mekugi-ana retaining hole. Higaki crossing filemarks and the back ridge of Nakago is a bit contoured. Shallow Ha-agari-Kurijiri of uneven U-shaped heel. Sophisticated dignified style of inscription KANESADA 兼定 is located l in front. The entire Nakago preserves an excellent taste of patina of nearly five centuries or more. Here is quite rare works by the Most Superior Artisan KANESADA 兼定 with the rumor of the Most Supreme Sharp Cutting performance as well so called Nosada 之定. From his extant works with the date of year, his activity period ranges earliest from Bunmei 4 (1472) to the end of Daiei 6 (1526) in 54 years. In his earlier stage on before Meiou 8 (1499), his signature "SADA" 定 was in square style like this example and changed it to the cursive style so has been called as NOSADA 之定 in his later age. 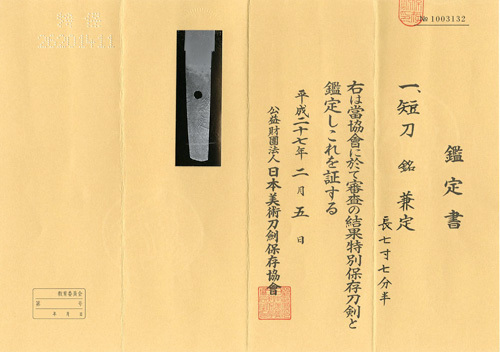 We can't miss it that he is the first swordsmith who enjoyed an official provincial government title granted by the Imperial Court "Izumi-no-kami" from Eisho 5-7 (1508-10). Here is one of the most excellent tantos in his early years before he changed it's inscription to cursive style. It clearly express the most flamboyant style of Hitatsura style in Soushu tradition whereas most of his later works of tanto shows decent Yamashiro style looking up Rai works. Double layers gold foiled Habaki collar, preserved in Shirasaya plain wood mounting.